Owain Glyndŵr Day is an unofficial holiday celebrated in Wales on September 16. It is dedicated to the national hero of Wales who was the last native Welshman to hold the title Prince of Wales. Many considered him an unofficial king of Wales. Owain Glyndŵr was born to a prosperous landed family, whose lands lay near the border between England and Wales in the area called the Welsh Marches. In the late 1390s, King II of England began to consolidate his hold on his kingdom and break the power of the wealthy landowners. He accused Owain Glyndŵr of treason, and Glyndŵr had nothing left to do but revolt. 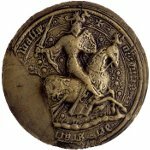 On September 16, 1400 Glyndŵr was proclaimed Prince of Wales by a small group of followers and started a rebellion against Richard II. In a matter of months, the uprising spread throughout Wales. The revolt lasted for more than a decade and began to dwindle after Glyndŵr’s disappearance in 1412. Nothing is known about his final years. Glyndŵr is presumed to have died in 1415, but a legend says that he is sleeping under a hill, awaiting the call to return and liberate his people. In the late 19th century, the Cymru Fydd (Young Wales) movement, whose main goal was to gain self-government for Wales, proclaimed Glyndŵr the father of Welsh nationalism. In 2000, two years after the creation of the National Assembly for Wales, the 600th anniversary of Glyndŵr’s uprising was celebrated all over Wales. Soon after the celebration, a campaign was launched to make September 16 a public holiday in Wales named Owain Glyndŵr Day. Although it hasn’t succeeded yet, some people celebrate the holiday unofficially.